Roasties, sitting in a hot duck fat jacuzzi. As much as we love it, our family jokes that the worst first date ever would be lunch consisting only of Costco’s free samples. We adore nibbling our way through the warehouse, and grazing our weight in little bites. But imagine a lunch date with a brand-new beau, dining on hand-outs. Not a great first impression. Last week Petey, The Kid and I visited Costco (1510 North Pointe Drive, Durham). Because of the holidays, the number of silver food trollies had vastly increased. We noshed our way through, made our purchases, and left for our next stop. My mom and dad live in Greensboro, and when visiting, it’s a huge treat to stop by Fresh Market. So much so, that a few years ago, I asked Santa for a gift card. There’s a lot to love. They have a large produce section, full of all the usual suspects, and many lesser known fruit and veg that are usually hard to find. They have an awesome bakery with a huge variety of beautiful freshly baked breads, and dangerous, decadent desserts. But no area has the ability to zombify me like the prepared food department zombifies me. It’s a large island in the middle of the store, with a multitude of ready-to-eat consumables. Deli, ethnic, finger food, dinner components, you name it. Their store-made pimento cheese has ruined me. I literally no longer eat or like any other kind—and I’ve tried. So upon leaving Costco, we eagerly visited the new Fresh Market (4215 University Drive, Durham), which had opened the previous day. The place was packed. Walking into the vestibule where the shopping carts are stored, we were greeted by stacks of the biggest apples I’ve ever seen. They were honestly as big as a baby’s head. Creepy yes, but the apples were this big. There was more, but being in a food coma will do things to one’s memory. At one point, The Kid grabbed me. In my child’s hand was a tub of rendered duck fat. This hard to find item is the holy grail of culinary adipose. It adds huge flavor to anything cooked with it. Chefs don’t call it ‘liquid gold’ for nothing. As soon as I saw it, I tossed it into our cart. I already knew the first thing I would prepare with it. Roasties are the roasted potatoes traditionally served with an UK Sunday lunch; a big traditional family dinner. 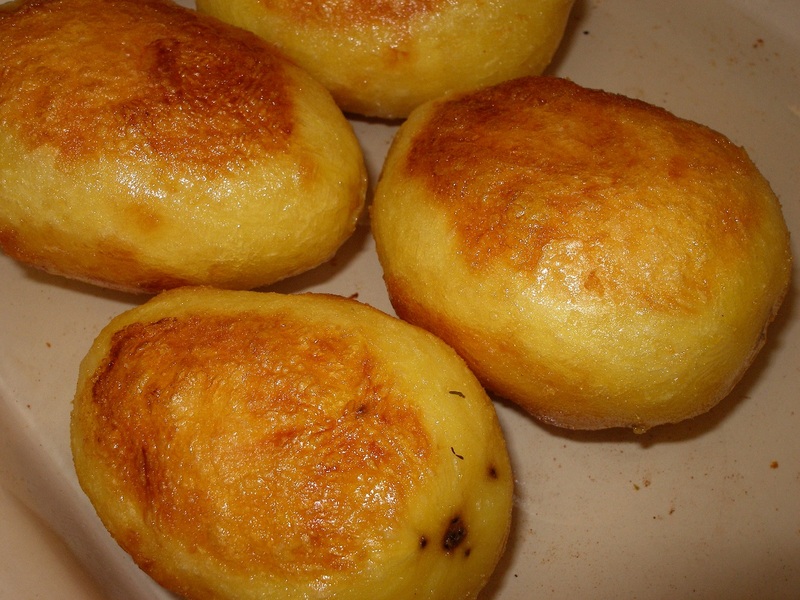 They are beautiful golden spuds, lightly crispy on the outside, and creamy on the inside. Preheat oven to 400 degrees. Place potatoes into a large pot of salted water and bring to boil. Boil for 5 minutes. Remove spuds from water and place in colander. Roll potatoes around in the colander to rough up the outsides. This step is very important as the rough surfaces will crisp up and color while roasting. 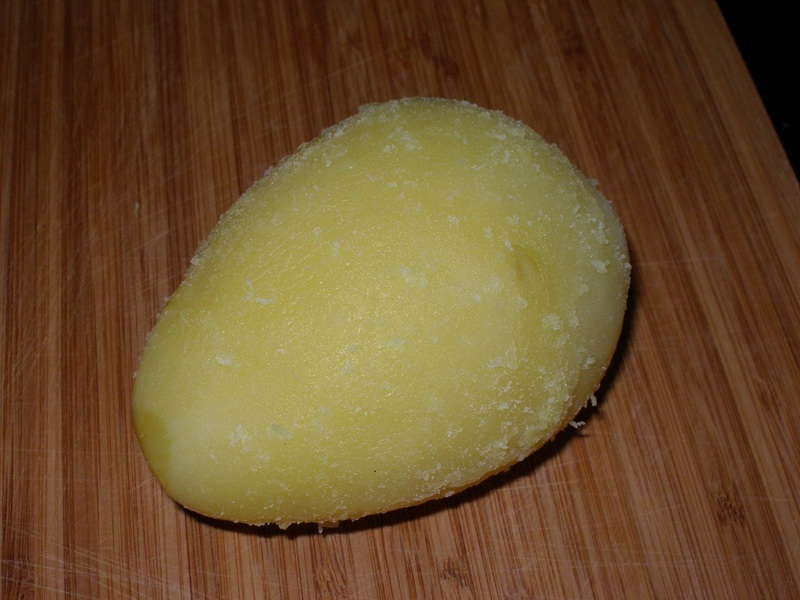 A roughed-up spud, ready to roast. Place roasting pan into the oven with the fat until the pan and fat are very hot. Remove from oven, and put in spuds, making sure the pan is big enough so that they don’t touch. Season potatoes, then roast, turning them every 15 minutes for 45-60 minutes, or until outside is golden, and insides are tender. After paying for the duck fat, and some of that amazing chicken salad, we hauled our bloated carcasses to the car. And I decided that the gastronomic bacchanal at the new Fresh Market would have made the best first date ever (for me, anyway).